1. What are the benefits of taking an International TEFL Organization Course? You can explore new cultures, make new international friends, learn a new language, improve your CV/Resume, live and work in exotic locations, travel the globe, give something back to the world and make a positive difference to other people's lives. You'll get an internationally recognised online TEFL course, a 120-hour accredited TEFL/TESOL certificate, personal tutor, online video & material, lifetime membership to our global job club, job guarantee, online teaching practice. 2. How long does it take to complete the TEFL course? It takes around 2-4 weeks to complete Part 1 of the online TEFL course but you have up to 6 months if need be. The Cambridge TKT course and online teaching practice modules will usually incur an additional 3-4 weeks study. You only really need to study for a few hours a week. You can download your TEFL certificate as soon as you have completed the course. In-class courses overseas are usually 4-weeks long. 3. Do I need a bachelors Degree (BA) to teach abroad legally? No experience or qualifications required to enroll in our TEFL courses. In some countries, you may also need a BA degree but not all. Officially, you need a BA degree to obtain a teaching permit in order to teach legally in countries such as China, Korea and Thailand. However, there are plenty of exceptions where a degree is not required and most of the ESL teachers there still do not hold any Ba degree. You can also teach privately or online over Skype with just a TEFL certificate. 4. How old do you need to be? What are the requirements to enrol in this course? * Be fluent in written and spoken English. * Have a desire to teach people to speak English. * Be positive and flexible, with a sense of humour. * Have the ability to produce a good standard of work. 5. Can you really teach English abroad with just an online TEFL certificate? Yes, you certainly can. There is an incredibly high demand for English teachers right now. As part of the TEFL course, we will also arrange teaching practice for you over Skype. Once you complete the TEFL course, we then put you in touch with hundreds of employers worldwide who need to hire teachers right now. They will also give you additional training in their methods and practices. You may join our Advanced TEFL course overseas if you feel you need some teaching practice before taking the plunge. 6. I saw a cheaper TEFL course, why is this? Virtually all of those cheaper courses are not internationally recognised, even though they often say they are. The International TEFL Organization are the world’s leading, and most recognized, TEFL course provider. We offer a fully accredited, internationally recognised TEFL course that you can take online in the comfort of your own home. We also help you find a job afterwards. Our tutors are highly qualified with at least three years experience teaching English overseas. 7. I'm concerned this may be a scam? We’ve been running TEFL courses online (and in Thailand) for over 14 years with over 15,000 graduates. We are members of IATEFL and we are moderated by the World TEFL Association. We only take payments by PayPal or Credit Card so your money is 100% secure. You can also view over 50 video testimonials here. 8. I can't afford this right now. Can I pay monthly? Yes. Remember that once you complete your online TEFL course you can earn over $1,500 (£1,000) per month teaching English at home over Skype or in a school overseas. How about a monthly payment plan? No worries, you still get instant access today. We're always happy to help you take the first step towards a bright new future. 9. Is my job placement guaranteed? Yes as long as you follow our instructions, we guarantee you will find a teaching job after successfully completing your TEFL course. Remember all job offers are subject to an interview by the prospective employer. 93% of our course graduates, who wanted to work, were able to secure a paid teaching job within a couple of weeks after completing our TEFL course. You do have to present yourself professionally as you would with any job offer. 10. What are my job prospects like and where can I teach? A TEFL course is your gateway to working anywhere in the world. With English becoming the "global language", trained TEFL teachers are in high demand, in primary and secondary schools, colleges, universities, and private language schools in over 150 countries from Thailand to Tanzania. There is also a growing demand for online teachers so you may work from home or while travelling. As long as you follow our instructions and take your time with each lesson, you will very likely pass this TEFL course. We'll do everything we can to encourage you and provide as much help as possible. The pass rate is a 70% average of all lesson exams. You can only take each lesson exam once. But If you fail the entire course, will will let you take the full course again until you pass. If for any reason you wish to cancel your place on the course 14-days after accessing our online course portal, TEFL cannot provide any refunds under any circumstances. 13. You have a full 1-year money back guarantee! If you follow our instructions and apply for at least 6 teaching jobs by phone(not solely by email) and you are unable to secure a teaching job, overseas or online after 12 months, simply return your TEFL Certificate and we will give you 100% of your money back. Does that sound fair? 14. Can I see some customer reviews? 15. Who are you accredited by? Contrary to popular belief, there isn't any single accreditation body for TEFL. There are numerous independent ones all claiming to be "the most accredited". Our courses are moderated by the World TEFL Association, Member No: T01167ET. We are also institutional members of IATEFL (International Association of Teachers of English as a Foreign Language) Member No: 24458. You may also upgrade to take the Cambridge (TKT) ESOL course and examination. This is ideal for people who want to prove their teaching knowledge with an additional globally recognised certificate. This course is accredited by Cambridge University ESOL Examinations. International Recognition and practical teaching practice are much more valuable to ESL employers than just accreditation. Our TEFL qualifications and courses are widely accepted and valued by employers around the world. They are internationally respected as the quality standard. 16. What about the Free buddy pass? 17. What about the Cambridge ESOL TKT certificate? The Cambridge ESOL (TKT) is an optional test that focuses on the teaching knowledge needed by teachers of primary, secondary or adult learners of English, anywhere in the world. It can increase your confidence and enhance your job prospects. This is an excellent addition to your TEFL/TESOL certificate course and will greatly enhance your job prospects, confidence and even your salary! You can study online but you must take the Cambridge ESOL exam at authorised centres all over the world. There are over 2,700 centres in 130 countries so you can also take the TKT exam in your home country once you have your TEFL/TESOL certificate. 18. What will I learn on the TEFL course? 19. Can I get a Job Without a TEFL Certificate? These days, anyone looking for a teaching job without a recognised TEFL certificate is in for a nasty shock. There are still a few countries in which unqualified teachers may find employment, but this is becoming rare. Also, unqualified teachers can expect much lower rates of pay than those who do hold a TEFL Certificate – basically they will only be offered jobs that qualified teachers wouldn't want to take. Most reputable schools and organisations around the world now insist that their teachers hold a recognised TEFL qualification such as a CELTA or TESOL. Proper training and certification, as opposed to a BA degree, will greatly increase the opportunities open to you. To put it simply, you wouldn't attempt to drive a car without first taking some driving lessons and gaining the necessary skills in advance. Teaching is much the same. Like driving, if you try to 'wing it' without really knowing what you're doing, the chances are that it will all go wrong. More importantly, you should remember that most students are desperate to learn English and it's costing them a small fortune. It’s only fair that you should know what you are doing and that you can take the money knowing you haven’t just ripped them off to increase your travel funds! 20. What Is TEFL, CELTA, TESOL? TEFL = Teaching English as a Foreign Language - Is the name of the industry which encompasses two major certificates, the Cambridge CELTA (Certificate of English Language Teaching to Adults) and the Certificate TESOL or similar (Certificate in Teaching English to Speakers of Other Languages) such as ITO. TESOL = Teaching English to Speakers of Other Languages. A more modern term which encompasses both TEFL & TESL. All of the above are used interchangeably in practice worldwide, they all mean virtually the same. 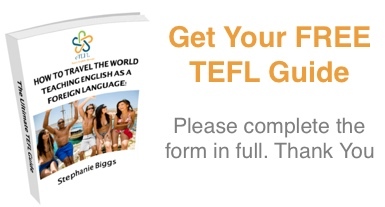 This term refers to the certificate you will receive on most TEFL courses. CELTA = Certificate of English Language Teaching to Adults. A very intensive TEFL course where the qualification is awarded by Cambridge ESOL, part of the University of Cambridge. Generally speaking, you should possess a high level of grammar knowledge before enrolling on a CELTA course. An International TEFL Organization (ITO) approved course is Ideal for beginners or experienced teachers and especially for those whose grammar isn't strong. You will learn how to teach all levels (children, adults, beginner, advanced, business, one-on-one) giving you multiple employment options. 21. What about the job placements and what are the job prospects like in general? All International TEFL Organization (ITO) approved TEFL certificates are accepted throughout the world by reputable organisations who employ English-language teachers. This means that you will most likely secure a teaching job before, or shortly after, you complete your TEFL course. 22. Is my job placement guaranteed? If you follow our step-by-step guide then you will easily find a job placement. It's really down to how you perform at any job interview. As long as you hold a TEFL certificate, present yourself properly and show some enthusiasm for teaching, you won't have any problems finding a teaching job in virtually any country around the world. If you however arrive at a job interview late, looking like you just fell out of bed, wearing flip flops, shorts or you look like you got mugged on the way to the interview - the chances are you'll never get a teaching job, regardless of what TEFL certificate you hold! We strongly advise that you should apply for any teaching job in person rather than by email. It's ok to call first and get the name of the school director or head teacher. On average 93% of all course graduates, who followed our instructions, were offered a teaching job within 8 weeks of completing their TEFL course. 23. How do the International TEFL Organization (ITO) courses compare to other TEFL courses? The International TEFL Organization (ITO) are the world's most recognized and reputable TEFL course provider and moderators. Since 2002, we have been responsible for setting standards within the independent ESL and TEFL/TESOL education sector. Our accreditation is held by dozens of ESL training providers around the world. Creating a community of trustworthy TEFL/TESOL course providers. Setting standards for trust and ethical business practices. Building trust in the TEFL/ESL marketplace. Encouraging TEFL training providers to deliver results in accordance with our standards and addressing customer concerns in a timely, satisfactory manner. You will gain a 120-hour, TEFL (TESOL or CELTA) qualification in 2 or 4 weeks and your certificate will be internationally-recognised and accepted throughout the world. We have added a comprehensive job club service to our package so now many students manage to find employment before they complete the course! No other TEFL organisation can offer you such an outstanding platform that allows you to confidently choose from a variety of TEFL courses online or around the globe. You are assured that each course is guaranteed to provide you with both quality training and international recognition. 24. I've heard that these courses are really tough, can I really make it through? These TEFL courses are quite intensive as they contain a great deal of content in a few weeks. However, If you approach the course with the right attitude and do your homework, you won't have any problems. You will enjoy a fun high impact TEFL course and you will gain an internationally-recognised qualification for life! 25. Where can I teach with these certificates? 26. Do I have to be a native speaker to take the course? No, but you should have native or near-native fluency in written and spoken English. 1. How do I join the course? Please complete the online application form in full. We will process your application and confirm your placement within 48 hours. 2. Will I get a certificate after the course? Yes, depending on what location/course you choose, you will receive an internationally-recognised TEFL (TESOL or CELTA) certificate upon the successful completion of the course. 3. What about accommodation for in-class courses overseas? Following acceptance of your enrolment application, a representative from your host TEFL school will contact you to assist in arranging suitable accommodation that is within your budget. You are assured that accommodation booked through us will be clean, comfortable and secure. Alternatively, you are free to arrange your own accommodation for the duration of your course. 4. Will this certificate get me a PAID job? 5. Are there any added costs? Yes. Accommodation and living costs for the duration of your course, flights and/or your travel expenses to and from the TEFL training centre are NOT included. Initial visa fees, vaccinations, insurance cover costs should also be considered. 6. Do I need to have a BA degree to enrol or to teach abroad? No - you do not need any qualifications to enrol in any of our TEFL courses. Also you don't always need to have a degree in order to find a teaching job in many countries. Private language schools will usually employ applicants who hold a recognised TEFL certificate. Universities and government schools normally require a BA degree and a TEFL certificate. Authorities in many countries, such as Thailand and China, now state that a BA degree is required to teach legally. In reality, this rule is disregarded if an employer can convince the local authorities that there is a teacher shortage and/or that students in the local community will be deprived of English tuition if their non-degree teacher is not granted a permit to teach. This is often the case. The regulations can change without notice so it's better to always check the legal requirements when applying for jobs. Unfortunately, many ESL teachers continue to work illegally in many countries due to the BA degree requirement. Yes, you should be at least 20 years old and in good health. There is no upper age limit! 9. What shall I bring on the day? A positive attitude, a copy of your passport, a laptop or iPad. "I thoroughly enjoyed my time earning my TEFL certificate and have met some fantastic people who I hope to keep in touch with for the rest of my life. The staff in Jane, Damian, Michaella, Cello and the others were fantastic people who deserve all the credit for being so patient, helpful and fun to be around. I can honestly say, hand on heart, the only thing that could have been improved is that it could have lasted longer so I could have savoured and enjoyed the experience for just one more week...Thank you all so, so much"